CGI Limited appear to be the parent company of Coinsinos, a self-contained MLM opportunity. The two companies have near-identical websites, so to keep things simple I’m going to refer to the opportunity as “Coinsinos”. Coinsinos operate in the cryptocurrency and gaming MLM niches. The company does not provide a corporate address on their website. The Coinsinos website domain (“coinsinos.com”) was privately registered on November 11th, 2017. Listed as co-founders of the company on the Coinsinos website are Lorence Irvine (CEO) and Daniel Grenon (Chief Marketing Officer). Lorence Irvine (right) is based out of the Philippines. Prior to founding Coinsinos Irvine was Zija International’s Country Director for the Philippines. Today Irvine cites himself on Facebook as a “Company Advisor for Zija International”. Daniel Grenon meanwhile was heavily involved in the OneCoin Ponzi scheme. 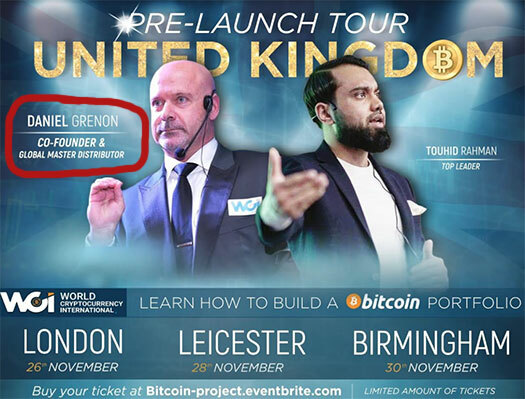 Grenon was a top Canadian OneCoin investor but left the company following his reported arrest in Tanzania at a OneCoin event in late 2016. 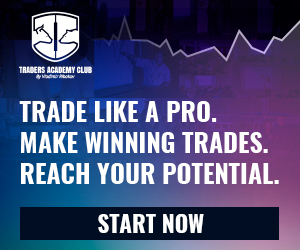 After OneCoin Grenon launched Worldwide Cryptocurrency Investment with Edward Hartley. Following Hartley’s death in July, 2017, Grenon renamed the company Worldwide Cryptocurrency International. Today the company is known as World Cryptocurrency International and markets itself as “a program you can trust”. The company still operates as a Ponzi scheme, however Daniel Grenon does not appear on World Cryptocurrency International’s “WCI-team” website page. Grenon was still actively promoting WCI as late as December, 2017. Whether he is still involved in the company is unclear. Prior to getting involved in cryptocurrency Ponzi schemes, Grenon was a top affiliate of Organo Gold. Read on for a full review of the Coinsinos MLM opportunity. the vision of the company is to create a new paradigm in MLM, Crypto Currency and online gaming. To that end the company runs an online casino off the Coinsinos website domain itself. Games currently offered on the Coinsinos casino website include “slots”, “live dealer” and “ladder game”. The games themselves look pretty cheap (reminds me of flash games from the early 2000s. They don’t run too well either and despite having a pretty decent desktop, experiences serious frame-loss and lag. To play with actual money you need a Coinsinos account. The signup form asks for personal details. This goes as far as a single-field for an address but no country field. As far as I can tell anyone from anywhere can sign up for a Coinsinos account. Coinsinos affiliates sign up and invest in one of seven offered affiliate packages. In addition to a monthly ROI, commissions are paid when Coinsinos affiliates recruit new affiliates who also invest. Coinsinos affiliates are paid to recruit new affiliates via a unilevel compensation structure. 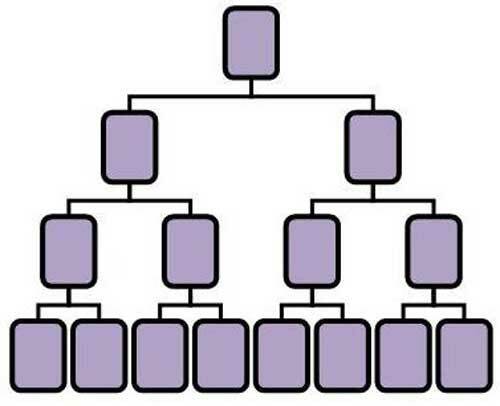 Coinsinos pay residual recruitment commissions via a binary compensation structure. These points are tallied up on both sides of the binary team when newly recruited affiliates pay package membership fees. At the end of each day Coinsinos tallies up new points generated on both sides of the binary team. Affiliates are paid 10% of points generated on the weaker binary side, with leftover points on the stronger side carried over. Coinsinos pay a three-level deep Matching Bonus on residual recruitment (binary) commissions earned by unilevel team affiliates. Coinsinos take 10% of casino profits every quarter and place it into the Pool Bonus. Coinsinos distribute the Pool Bonus to affiliates based on acquisition of Pool Points. One Pool Point corresponds to one share in the quarterly Pool Bonus. The primary difference between the affiliate packages is income potential via the Coinsinos compensation plan. Note that there’s also a free Coinsinos affiliate 14 day preview option. Free affiliates must invest real money in one of the above packages within fourteen days otherwise their positions are deleted. While it’s tempting to take Coinsinos to task for offering punters gambling on cockfights, there are far more pressing issues with the business. I will state however that the introduction of cockfight gambling (that is getting two roosters to fight until one dies or is critically injured), is something that should have no place in the MLM industry. 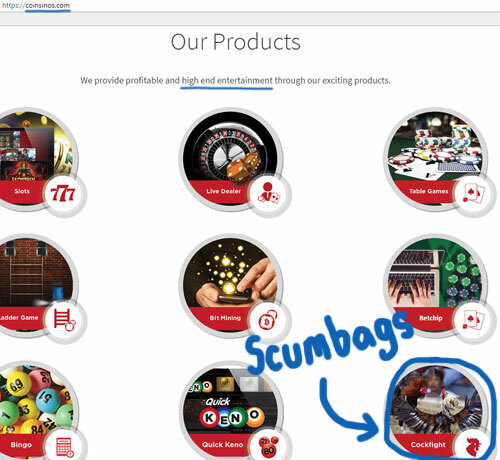 With respect to CGI Limited and Coinsino’s business model, the company claims it offers a fusion of “cryptocurrency & gaming”. We are changing the norm in the gaming industry. YOU are the casino. We play, We earn. As far as I can tell however, Coinsinos’ the casino angle is smoke and mirrors. The compensation plan is primarily funded by affiliates who invest on the promise of a daily ROI. Commissions are generated via recruitment of new investors. This is your classic Ponzi pyramid hybrid set up, and because of that it really doesn’t matter what CGI Limited or Coinsinos attach the business model to. Even crypto cockfighting. A lot of people are taking multiple positions. That’s what a lot of people do, they (Coinsinos management) don’t mind that. As long as your top position sponsors the other, so you’re not blocking out the upline. They don’t like that, they’ll change it if you do. The investment positions are what is actually being marketed and sold within Coinsinos. Cryptocurrency, gaming and whatever else they might come up with is window dressing. If you’re like me you’re wondering where cryptocurrency fits into all of this. Although not explicitly clarified, I believe the betchips are being set up as an in house cryptocurrency. Either that or they’re just pointless tokens to launder invested funds through. Coinsinos’ compensation plan material also mentions mining, however as far as affiliates getting paid there doesn’t appear to be any direct correlation. Rather I suspect crypto mining is only mentioned to create the illusion of external ROI revenue. 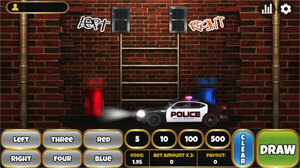 Lip-service to casino profits (who is going to play crappy flash games?) and mining operations is all very well, but the only verifiable source of revenue entering CGI Limited and Coinsinos is new affiliate investment. Using any amount of new investment to pay existing affiliates a daily ROI would make Coinsinos a Ponzi scheme. The rest of Coinsino’s compensation plan is “pay to play” pyramid fraud, with affiliates paid directly and residually to recruit new investors. This alone (forget about gambling regulation and cockfighting) is illegal in pretty much every jurisdiction Coinsinos could hope to operate in. And that brings us to the obvious: None of this is even remotely legal in the US. Coinsinos is not available in certain countries and territories including United States of America. Well that’s one jurisdiction taken care of, right? Despite claiming Coinsinos is not available in the US, Alexa currently peg the United States as the primary source of traffic to the Coinsinos website (79%). I’m aware of at least two other CGI Limited websites set up, however neither has significant enough traffic for Alexa to provide metrics on. So why is Coinsinos’ biggest source of website traffic from a country the company claims it isn’t operating in? The answer is pseudo-compliance, because Coinsinos management themselves are busy low-key promoting Coinsinos across the country. 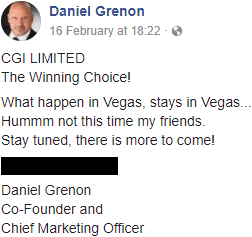 As the Facebook post to the right shows, about a week ago Daniel Grenon headed up a Coinsinos recruitment event in Las Vegas. Call me cynical but Coinsinos game-plan appears to be “get as many US investors on board” before a public “oh we don’t operate in the US lulz” launch. Primarily US affiliates will profit at the top of the compensation plan, with gullible suckers in third-world countries the targeted victims of choice. Money wise Coinsinos are buying themselves a year to come up with 100% of invested funds. They have to as a good portion of funds are paid out as recruitment commissions. More will be lost once promotional travel expenses are factored in. Those who get in early will make back what they invested through recruitment commissions, irrespective of whether Coinsinos sustains recruitment of new investors for a year. The monthly ROIs will continue to be paid out until invested funds run out, at which point the DDOS, “we got hacked”, “banks are too small for us”, “someone’s mom died” excuses will be trotted out. The wildcard is US regulators, who might also move to shut the company down before it takes off locally. Bottom line? CGI Limited and Coinsinos are a new coat of paint on the same old Ponzi pyramid house of cards.